On Episode 38 of Unmuffled it’s a show of champions. First we catch up with 2018 NASCAR Monster Energy Cup Series champion and Middletown native Joey Logano as he celebrates his title this week in Las Vegas. We also talk with NASCAR Whelen Modified Tour driver Dave Sapienza, who added 2018 Turkey Derby champion to his resume recently. And we close you the show catching up with Berlin native Scott Zipadelli, who was the crew chief for 2018 NASCAR Camping World Truck Series champion Brett Moffitt. 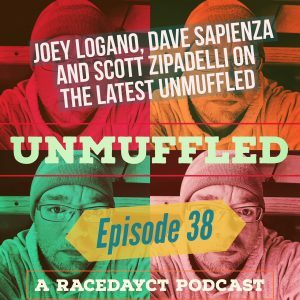 Episode 38 of Unmuffled is presented by our Patreon marketing partners from RH2Way Radios, Swanson Buick/GMC, LifeCare Family Chiropractic, SAFCO Foam, Mid-State Site Development, Draco Racing Springs, Dunleavy’s Truck & Trailer Repair, Mike Smeriglio III CPA, Hoosier Tire East, Independent Wheel, Falmouth Ready Mix, Wheelers Auto, Rent A Race Car New England, Four Seasons By The Lake, Sign Pro, North End Auto Parts, New Hampshire Motor Speedway, Stafford Motor Speedway and Thompson Speedway.